Universities and Science Minister David Willetts has hailed the new Southampton Martine and Maritime Institute (SMMI) as exemplary of the relationships required between industry and higher education to drive future economic growth in the UK and around the world. Mr Willetts formally opened the Institute during ceremonies in Southampton accompanied by Professor Don Nutbeam, University of Southampton Vice-Chancellor, and Richard Sadler, Chief Executive Officer of Lloyd’s Register (LR). The creation of the SMMI has been stimulated by the University’s ever strengthening relationship with LR over the last 40-plus years. 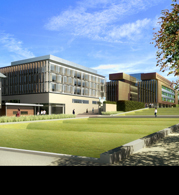 The Institute will eventually be located on premises alongside LR in Southampton on the redeveloped Boldrewood Campus of the University, due for completion in 2014. This development has resulted in an investment of around £116M in the new campus, the largest such business-focused endeavour in any UK university. “Industries and universities have a vital role to play collaborating together to achieve sustained economic growth,” said Mr Willetts. “Southampton has long been a centre of excellence for the marine industry so it is a fitting home for this new Institute.